Another item found on the information panel of a pet food label is the feeding guidelines. These tell pet owners how much to feed based on their pet’s body weight and life stage. This amount can be highly variable from one brand of pet food to another. A key difference between high-quality and low-quality pet foods is the digestibility of the product. This is the amount of nutrients in the food that the animal is able to break down and absorb within its gastrointestinal tract. For a more digestible food, the animal is able to use the nutrients provided more efficiently and therefore needs to be fed less. With a less digestible diet, the animal would need to be fed more grams or cups of food per day to ensure the same amount of nutrients are absorbed. By comparing the amount required to be fed per day and the price of the food, we can sometimes find that a more expensive food (on a weight basis) is actually cheaper than a more economical food when daily food costs are calculated. It is critical that the feeding guidelines be followed when feeding pets. Estimates indicate that nearly half of the American pet population is overweight. The main causes of obesity in pets mirror those in people – consuming too many calories and not exercising enough. By carefully measuring the amount of food a pet should receive each day, obesity can be prevented. Obesity carries similar health risks for companion animals as for humans. An 8-oz measuring cup should be used to measure out one cup of food. To ensure getting this amount of food each time, pet owners can place a mark on a scooper or cup they use to feed their pet daily, or they can simply use a measuring cup as a food scoop. In some cases, feeding the recommended level on the label will still result in overfeeding the pet. Label guidelines are merely estimates for the average animal, and in some cases, the animal may need to consume slightly less than the label guideline, particularly if the animal is less active. While caloric density (kilocalories per cup) is not required to be on pet food labels, many companies provide this information either on their labels or on the company’s Web site. Utilizing this information can make calculating the pet's calorie intake more accurate. 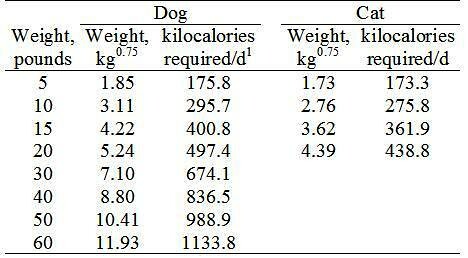 The equation to calculate a dog’s daily energy requirement in kilocalories per day is 95 x (body weight in kg)0.75 for a typical pet dog and is 130 x (body weight in kg)0.75 for an active adult dog (Table 1). The daily caloric requirement for a pet cat can be calculated using 100 x (body weight in kg)0.67. To use these equations, the pet’s weight in pounds should first be converted to kilograms by dividing by 2.2. The energy requirement calculation will indicate how many calories the pet should consume per day. Dividing the calorie intake per day by the kilocalories per cup in the pet food provides an estimate of the exact number of cups of food to feed your pet per day. For example, if your dog food has 374 kilocalories per cup and your dog weighs 10 pounds, the animal would need to consume about 0.8 cups or 4/5 of a cup per day (295.7 kilocalories per day divided by 374 kilocalories per cup equals 0.79 cups per day). 1 Calculated using 95 x (body weight in kg)0.75 for a typical inactive pet dog. It is critical to monitor a pet’s weight for changes over time and adjust how much and what it is being fed accordingly. One beneficial method for tracking a pet’s weight is to use a body condition scoring chart. Body condition scores estimate how closely an animal is to its ideal weight based on the physical appearance of the pet. The ideal dog should have a clear waistline, the abdomen should be tucked up in the back, and the ribs should be easily felt. The ideal cat should have an observable waist and ribs that can easily be felt under a light layer of fat. One good body condition scoring system was developed by Nestle Purina Pet Care and is available though their Web site (Purina.com) or on many of their pet food labels.